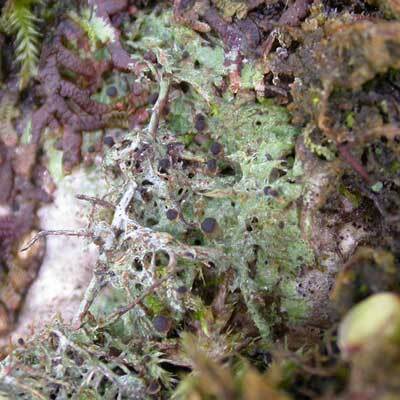 This rather distinctive lichen has a grey-green, skin-tight thallus with numerous brown stumpy, jelly-like lumps scattered over the surface that also happen to be the furrowed-stalked discs. It colonises mossy trees (especially the root plates) and rocks in open, but sheltered, old woodland sites. In Ireland, it is most frequent in the west. On the roots of basic-barked trees and on mossy rocks; sheltered woods with broken canopy, western oceanic. Simms, M. J., (2016). Gomphillus calycioides (Del.) 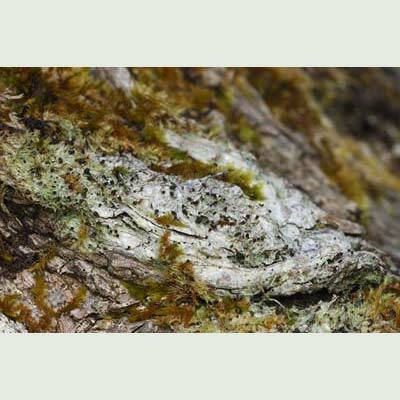 Nyl.. [In] LichenIreland.